Mutant "zombie bees" that act like the ghoulish creatures of horror films have surfaced in the Northeast after first appearing on the West Coast, a bee expert told ABC News on Wednesday. "They fly around in a disoriented way, get attracted to light, and then fall down and wander around in a way that's sort of reminiscent of zombies in the movies," Hafernik said. "Sometimes we've taken to calling [it], when they leave their hives, 'the flight of the living dead.'" The professor accidentally discovered the zombie bees in California in 2008, and since then cases have been reported in Oregon, Washington state, California and South Dakota, he said. The effect starts with a fly called the Apocephalus borealis, which latches onto European honeybees — common across the United States — and lays eggs in the bees that eventually hatch and wreak havoc on their hosts, Hafernik said. "It's sort of a combination of zombies and aliens mixed together," he said. But there's not necessarily any threat of a zombie (bee) invasion anytime soon, according to Hafernik. The Vermont iteration of the bees first came to light when Anthony Cantrell, a hardware-store employee who took up beekeeping as a hobby less than a year ago, noticed some dead bees outside his home. Later, he came across ZomBeeWatch.org, a website run by Hafernik and his colleagues, and realized some of his bees might have become infested. Honeybees sometimes become infested by other parasites and diseases. "I just thought, great, one more thing that the poor honeybee has to deal with," Cantrell, who has two hives, told ABC News. 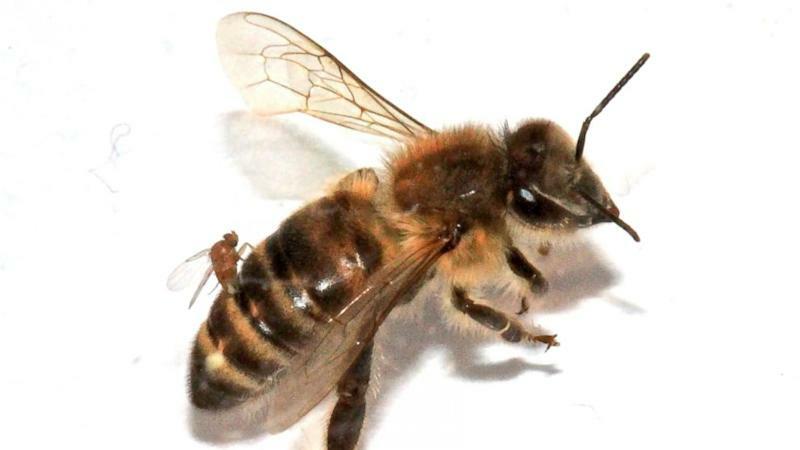 Steve Parise, an agriculture production specialist with the Vermont Agency of Agriculture, Food and Markets, on Tuesday brought up the threat posed by zombie bees, at a meeting of the Vermont Beekeepers Association, according to Cantrell, who is a member. Farmers rely on bees to pollinate agriculture fields and produce honey, but there hasn't been any sign of a widespread infestation, even though it remains unclear just how many bees across the continent have been infested, he said. While researchers at San Francisco State University have confirmed reports of the parasitic flies infesting bees up and down the West Coast — one-third of hives in the San Francisco Bay Area may at certain points in time be infested — no confirmed cases have popped up in the Northeast since October, according to Hafernik. Once the flies infest bees with their eggs, the bees start exhibiting zombielike behavior; then, once the eggs hatch, they generally drop dead after about five minutes, he said. The culprit fly was originally discovered in the 1920s, in Maine, and has been found across the United States, where it had been known to parasitize bumblebees and yellow jacket hornets — but not honeybees, he said. In Vermont, the state's Agency of Agriculture may trap bees to investigate the zombie bee threat, according to The Associated Press. Cantrell's waiting out the winter to see if the parasite survives the winter.